Editor's note: Our guest blogger today is James Anderson, CEO of Architectural Windows & Doors, a small family run business that supplies and creates “upmarket” windows and doors for residential properties across Queensland and Northern New South Wales. See what other organizations that have gone Google have to say. At Architectural Windows & Doors we supply and install windows and doors. But we take true pride in the work we do with our customers as design consultants to turn architectural concepts into reality. We’ve been in business in Brisbane for over ten years and employ around 20 staff. Many parts of Queensland are prone to cyclones and extreme weather so we not only work to find the right look when customising designs, but also the highest safety features. No strangers to disaster ourselves, our store was severely damaged during the Queensland Flood in 2010-2011. And like many small businesses, we felt the heat during the financial crisis, so we are always looking for ways to keep costs down while still delivering the same top quality products and customer service. Our delivery and installation team are always out on-the-go in meetings with clients, doing installations, or picking up materials at the factory. So having a good workforce management tool to see where our mobile workers are is critical; not only to manage jobs and productivity, but also so we can ensure their safety. We started using Google Maps Coordinate in September last year. Before that, we used a solution which cost $100 per month per vehicle. Since moving to Google we’ve noticed major productivity and service improvements as well as cost benefits. For a start we’re saving about $400 a month. The productivity and safety benefits have been big too. 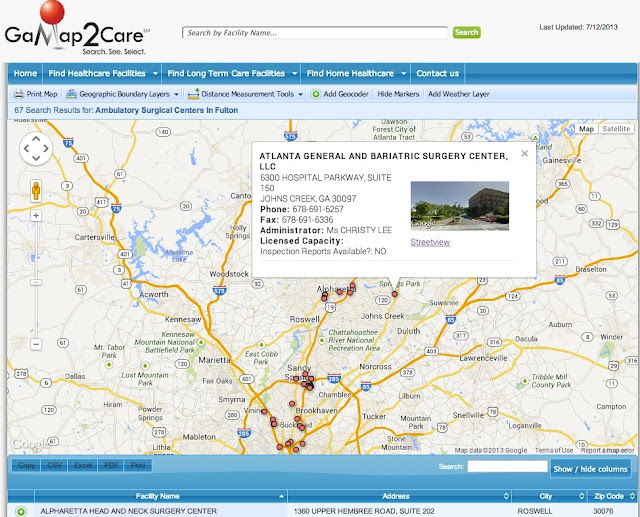 Because Google Maps Coordinate integrates mapping, scheduling and job detail functions into the one handset based system, we can create jobs and assign staff based on their locations all in one go. We no longer have to worry about duplicating data either. Our team members can look up client information and update their records seamlessly, eliminating pointless trips back to the office. We were a Google Apps customer for three years before moving to Coordinate, so our email, documents and scheduling apps are also accessible from our phones. This means our team can access everything it needs while on the road. As Google Maps Coordinate is handset rather than vehicle based, we now also have accurate data on where our guys actually are at any given time. Previously we only knew where they parked their vehicle, which could have been a couple of blocks down the road from a client’s house. This would pose a problem for health and safety. Because our teams always have their phones on them, we now have peace of mind knowing where they are when they’re on the job. And they can turn that function off when they’re not working or heading home for the day. Additionally, some of our site-staff don’t return to our factory to clock in or out, so Coordinate helps us accurately record their hours worked and ensure they have their required breaks (by using the visibility feature) in the absence of a timecard unit. Google Maps Coordinate is an ideal solution for an SMB like us. It provides us with a world-class mapping and technology solution and scales for our budget and needs. Small businesses should be able to access the same technology solutions as the big boys and by bringing Google’s mapping technologies to modern smartphones, Google Maps Coordinate does just that. Editor's note: Today’s guest post is from Ben Kamens, Lead Developer at Khan Academy, a not-for-profit that provides a free education available for anyone. See what other organizations that have gone Google have to say. Be open. Share your work. Google Cloud Platform provides a flexible and reliable environment to put these principles into practice. With Google App Engine in particular, we get a big, enormous, whopper of a benefit — consistent Datastore performance no matter how big the product gets. Even if we have a query that returns 10 items from a set of 10,000, we can relax. We know that as our company grows over time, we’ll get the exact same speed when pulling 10 items from a set of 10,000,000,000. Lots of people ask, “How will you know if Khan Academy is really successful?” My answer is always the same: we of course care about data, analytics, and metrics that demonstrate provable, real learning. But in the back of my mind I’m most persuaded by the personal stories that people send us literally every day. Those stories of real lives being changed for the better are the reason why we believe a free educational resource like Khan Academy simply must exist. Editor's note: Today’s post comes from guest blogger Ernest L. Cu, President and CEO of Globe Telecom, a telecommunications company in The Philippines. See what other organizations that have gone Google have to say. At Globe Telecom we work to quickly and easily connect people to one another and to the information they need. As one of the country’s largest telecommunications companies, we have a vast network of mobile, fixed line, and broadband Internet services that connect 36 million customers across over 7,000 islands of the archipelago. Filipinos love technology. In fact, we have the highest rate of smartphone adoption in South East Asia. The country is experiencing an exciting time of economic growth, and to support this growth and provide our customers with the great service they expect, Globe is going through its own process of transformation and innovation. We’re upgrading our network and systems as well as moving our headquarters to Fort Bonifacio. To manage this change and give our customers great service, our internal communication systems need to be fast and reliable. This is why we’ve decided to make the switch to Google Apps. Moving to a cloud-based set of tools and being able to access information from any device at any time means that everyone from the head office, to store employees, to call center staff and vendors will be able to connect more easily. This will ultimately improve our customer service, as well. By finding new ways to collaborate, we’ll not only be able to improve our customers service, but it will also help us focus on innovation. Managing projects is a large part of everyone’s work life at Globe, and now our teams will be able to coordinate their projects more efficiently with Google Calendar and Google Sites. When we ran a test with Google Apps it took just a few hours for 50 of our non-technical staff to set up team sites, add their calendars, agendas and profiles and start working together on campaigns collaboratively. This is much faster than any system we’ve used before and will open up lots of avenues to be more innovative. A big part of our culture is having face-to-face meetings, so Google+ Hangouts will be a great way for us to connect face-to-face with our colleagues around the country instead of flying or driving everywhere. Using consumer tools like Gmail and Google Docs have other benefits too — staff are familiar with these tools from their personal lives and when given choice, 73% of our employees voted to use Google Apps. As a company focused on driving innovation and collaboration to give our customers a great experience, we’re looking forward to undertaking this journey with Google Apps. If you're a Google Apps for Business, Government or Education customer, today we're releasing a few new features designed to make it even easier for you to get things done with Google+. Over the next few days new business-focused features for the Google+ app on Android and general availability of the Google+ Domains API will be rolling out. Next, you can now create restricted posts from the Google+ app on Android. Restricted posts can’t be shared outside your organization, so your private conversations are only visible to your coworkers. 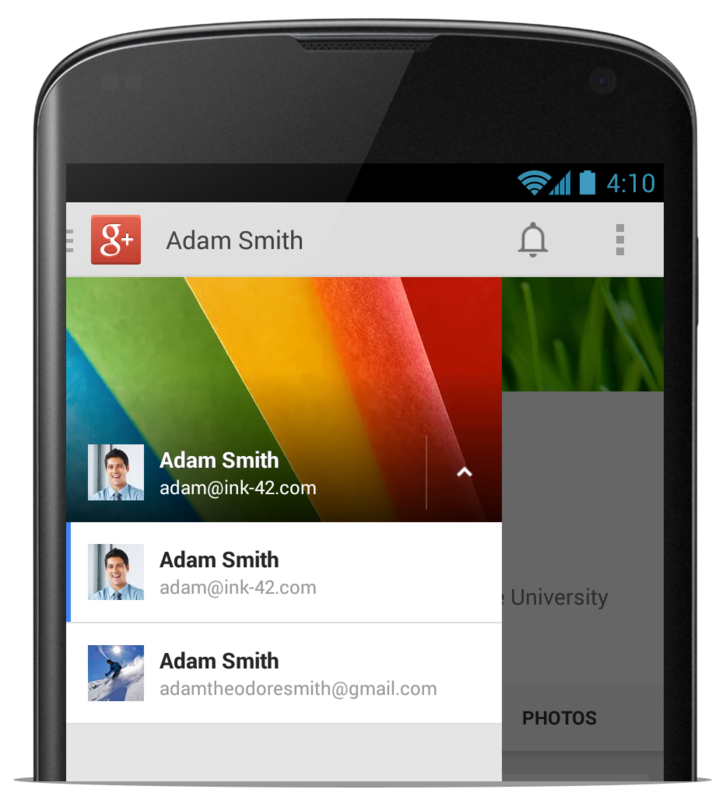 At Google I/O in May we announced a limited preview of the Google+ Domains API. 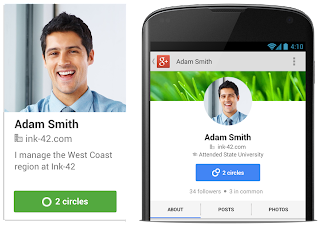 Starting today the Google+ Domains API is available to all Google Apps customers. 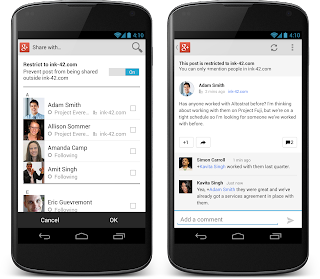 The API allows Apps customers to integrate Google+ into their existing tools and processes, and allows enterprise software vendors to access Google+ from their products. If you’re a Google Apps for Business administrator—or if you know one—you know it’s not just about managing users, services and devices. It’s also about keeping users secure and productive—and, after receiving some great feedback from our customers, we’ve found a way to make that easier. 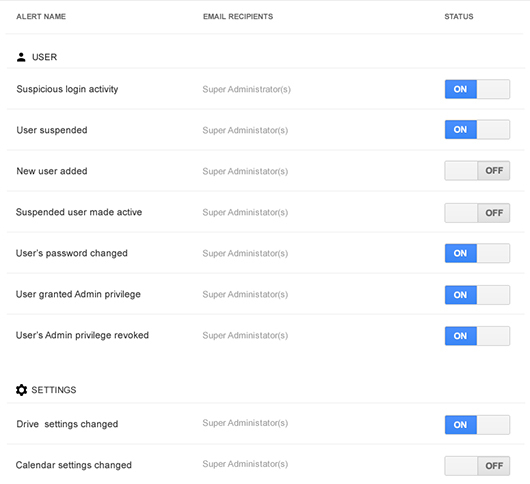 Now, admins can elect to receive customizable email alerts when certain events of interest occur. By subscribing to alerts, admins can stay informed and, when needed, take prompt corrective action. These alerts are also helpful when multiple admins work together and want to stay informed on these changes. 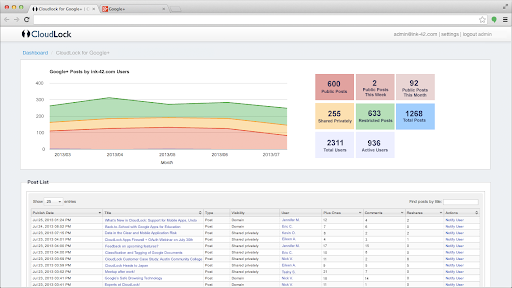 To see the latest alerts – and to subscribe to emailed alerts – simply login to your Admin console (admin.google.com) and go to Reports > Alerts. Questions? To learn more, visit the help center or contact our support team that is available by phone or email 24/7. Since we launched Google Apps Vault, thousand of businesses, schools, and governments have adopted it to archive, retain, and manage business-critical information. Until now, customers have only been able to buy Vault for their entire domain. Now, with partial domain licensing, you can buy Vault for specific users or by organizational units, enabling you to save money and focus your efforts. Google Apps Vault helps protect organizations of all sizes from lawsuits by enabling them to quickly find and preserve email messages that may be relevant to litigation, reducing investigation costs. Vault also helps manage and preserve business-critical information for continuity, compliance, and regulatory purposes. You can add Vault to an existing Apps account, or purchase it in conjunction with Apps, for $5 per user per month. If you purchased Google Apps online directly from Google, you can purchase Vault from your Apps Admin Console. If you purchased Vault from a reseller partner, please contact them to purchase additional Vault users. 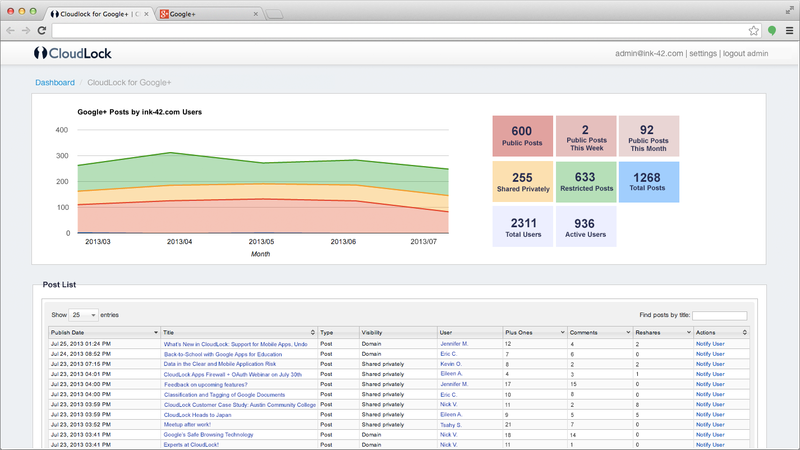 And, finally, please contact us if you are a Google Apps for Education or Government customer interested in Vault.